Mu Cang Chai’s beauty is not only shown by the miraculous scenery, but also the human presence here. The vision of the ethnic people harvesting the ripe, full-yellow rice seedling is like a mixture of colors, brightening up the corner of the Northwest sky. The pattern on the colorful costumes of the ethnic people here is drawn by beeswax mixed with color. Therefore, the costumes of the ethnic people in Mu Cang Chai always have special colors that no other dyes can create. Normally, people here harvest in the afternoon, since it’s the time when the sunshine is most bright. 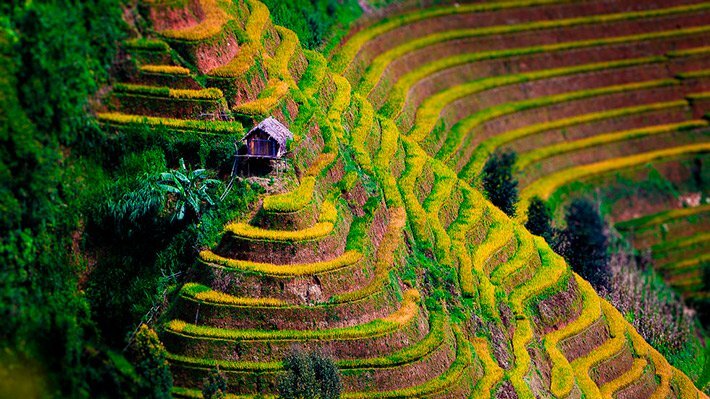 Rice terrace in Mu Cang Chai is famous as " the top of the beauty from culture and labour of Vietnamese people". The most beautiful time in the area is from September to October which is golden rice season. Mu Cang Chai is a highland district of Yen Bai province locating under the foot of Hoang Lien Son mountain. From Hanoi to Mu Cang Chai, you need to go about 280km when passing by Khau Pha pass, one of the most adventurous and beautiful passes in West North of Vietnam. 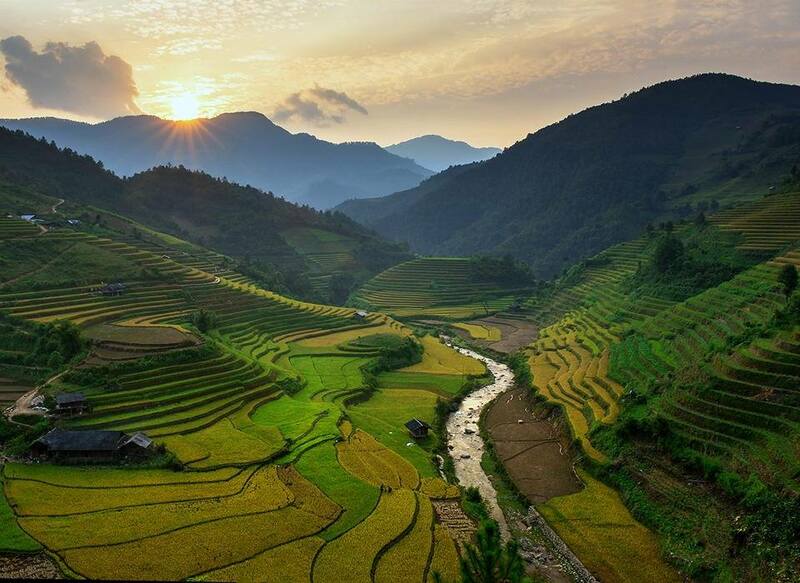 Mu Cang Chai is famous for rice terrace on splendid hills and known as national landscapes with Hoang Su Phi and Sapa. The foundation history of rice terrace was connected as history and culture of ethnic minorities. Ethnic minorities believes that universe has life and soul, so rice terrace, labor tools, rice, etc. are deified like rice god, the god of thunder, etc. The most famous rice terraces in Mu Cang Chai are ones on La Pan Tan, Che Cu Nha and Ze Xu Phinh commnues. Until now, the people still preseves custom and ceremonies as well as beliefs in farming rice terrace. 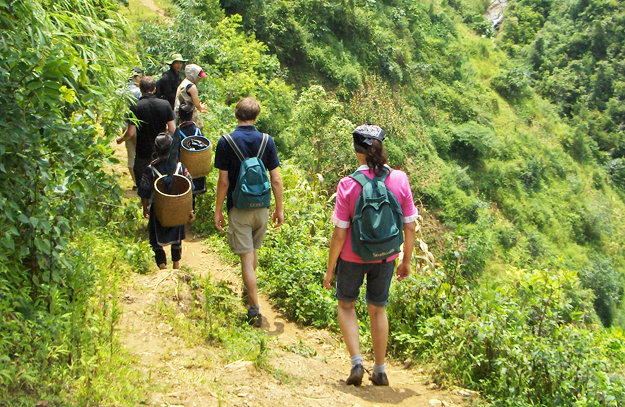 La Pan tan and Ze Xu Phinh are far 15km and 20km from Mu Cang Chai town. And Che Cu Nha commune is far 7km from the town. In reality, Mu Cang Chai has two seasons a year: spring season ( April and May ) and main season ( September and October). In spring season, the people will focus on lower fields because high hills don't have enough water for farming. At the beginning of September, Mu Cang Chai is covered by splendid yellow color. 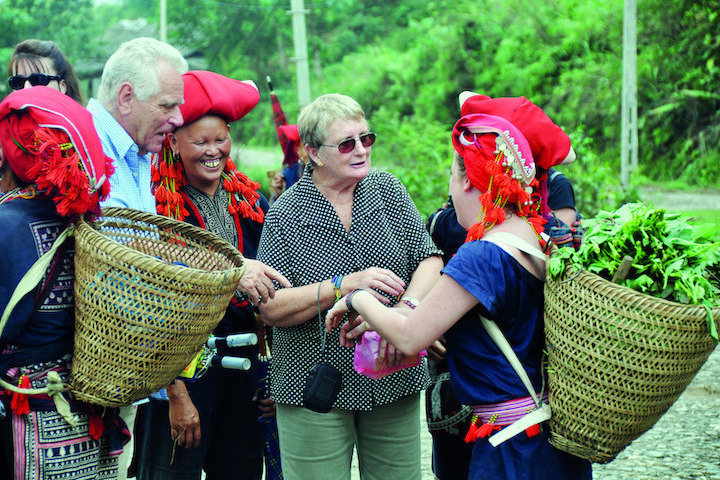 The beauty of West North mountain always attracts interest of tourists. Our guide will pick you up at hotel, then driving to west of Hanoi following the national way – No.32 to Nghia Lo district of Yen Bai province. Have a lunch in local restaurant in Nghia Lo, then keep on driving up to Mu Cang Chai. We stop-over in Tu Le for visiting and admire of the imposing landscape of mountains and valleys and the beautiful rice terrace filed of this area – Tu Le, Van Chan district of Yen Bai province. Dinner and overnight in Mu Cang Chai. After breakfast, we will get a transfer to a trekking point for the whole day trek to enjoy Vietnam’s national rice terrace heritage. 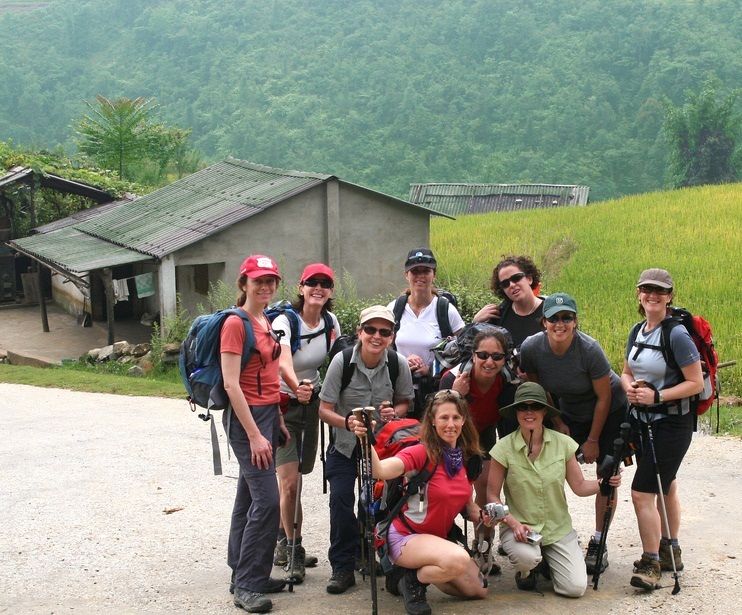 Our trek will start from Che Cu Nha commune to La Pan Tan Commune. It is around 13 km and takes most of our day. 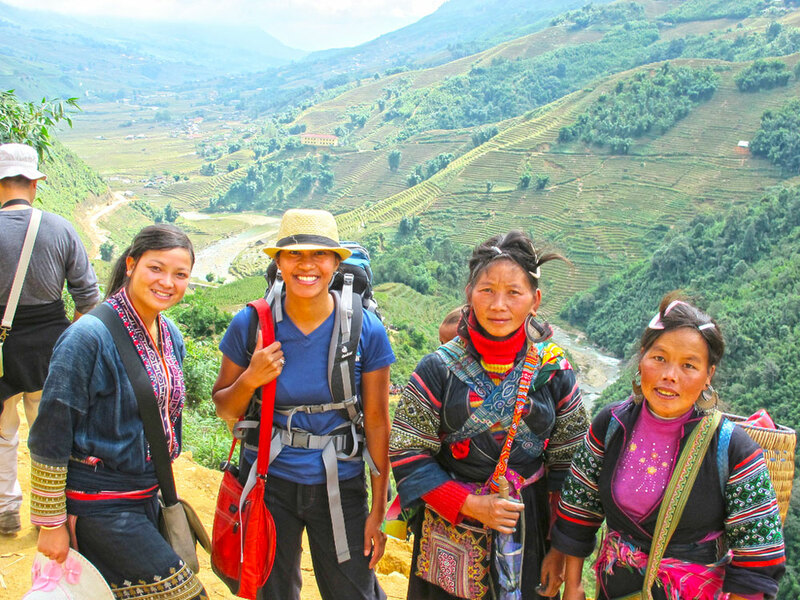 This trek will definitely offer us a good opportunity to see the main spots and admire the beauty of amazing rice terraces that Mu Cang Chai has to offer. 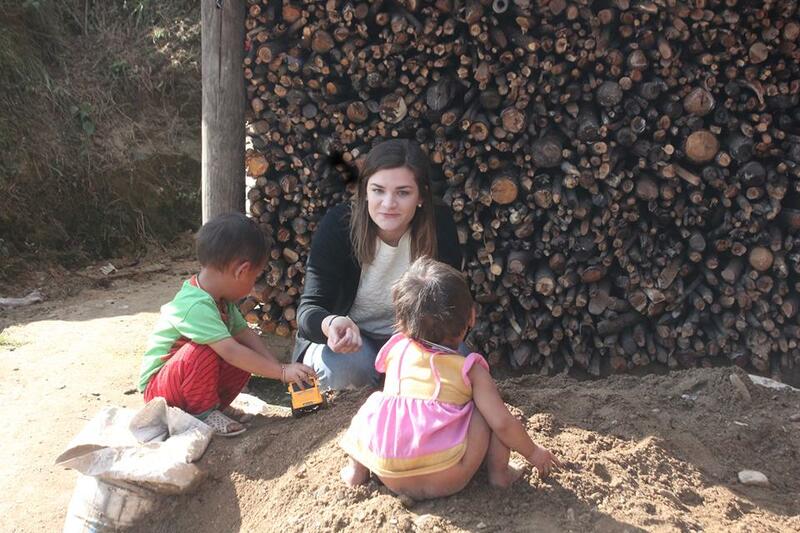 We will also be able to visit a few villages of the H’mong hill tribe scattered in the area. Get picked up by our private vehicle around 4.30 PM. Dinner and stay for the night. After breakfast, we depart to Sapa - old town with its remnants of the French colonial era. 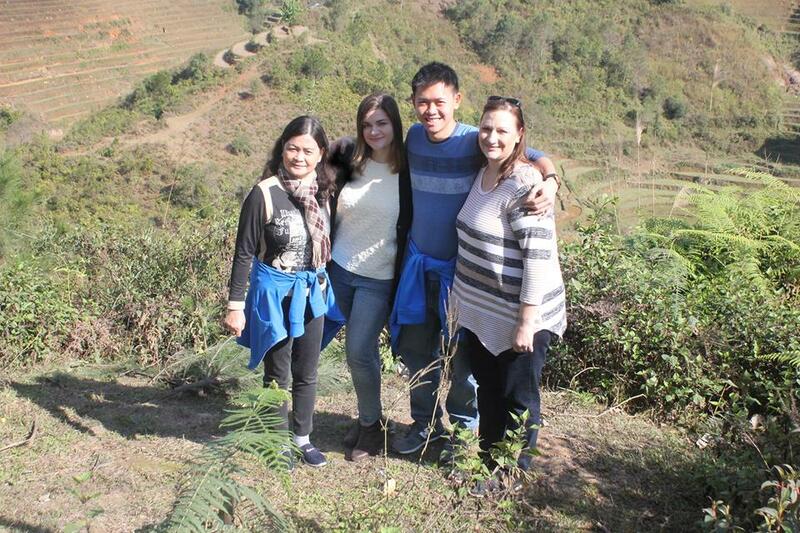 On the way, you will be admired the beauty of O Quy Ho pass (famous pass of the North Vietnam). Arrival Sapa, have a lunch in local restaurant and check in the hotel. In the afternoon, driver and tour guide take to visit Cat Cat village. Upon arrival explore Cat Cat villages, inhabited by the H’mong people, a French colonial area and a renowned resort for officials from the early 20th century. Visit the hydro-power station and the waterfall of Cat Cat village. Learn about the culture and customs of H’mong people including traditional crafts such as weaving, carved silver and hand-forged agricultural tools. In the evening, enjoy dinner with some wine or soft drinks. Overnight at hotel. After breakfast, driver & tour guide take you to Cable Car Station and spend 20 minutes with cable car to enjoy the spectacular scenery. Reach the altitute of 2800 metres, you have a good time to see the view and take photos, visit pagoda the spiritual destinations and trek up to 600 steps you will reach the peak of Fansipan - the roof of Indochina. At noon, have lunch in a local restaurant. Transfer back to your hotel in Hanoi city. End of tour. At 08:00 AM, depart to Halong Bay. The car takes us through the Red River Delta for 3,5 hour and we will arrive the port at around midday. Arrival Halong city, enjoy the lunch in the restaurant. After lunch, tour guide and driver take you to Halong wharf. Start cruising, you’ll enjoy a global overview of different wonders that this UNESCO World Heritage site has to offer. You will be admired the beauty of the bay and take pictures when the cruise passed Hon Trong Mai, Luc Dinh Huong.... Then visit Thien Cung cave – the most beautiful cave of the Bay. Back to Halong wharf, you have dinner with delicious sea foods. You have free time at Tuan Chau entertainment. You can join some very interesting activities such as seeing the “jumping Dolphin or sea lion” show, or “dancing lights on the water with music” show (ticket will be arranged by your own way). After breakfast, free time for swimming and discover on Bai Chay beach. 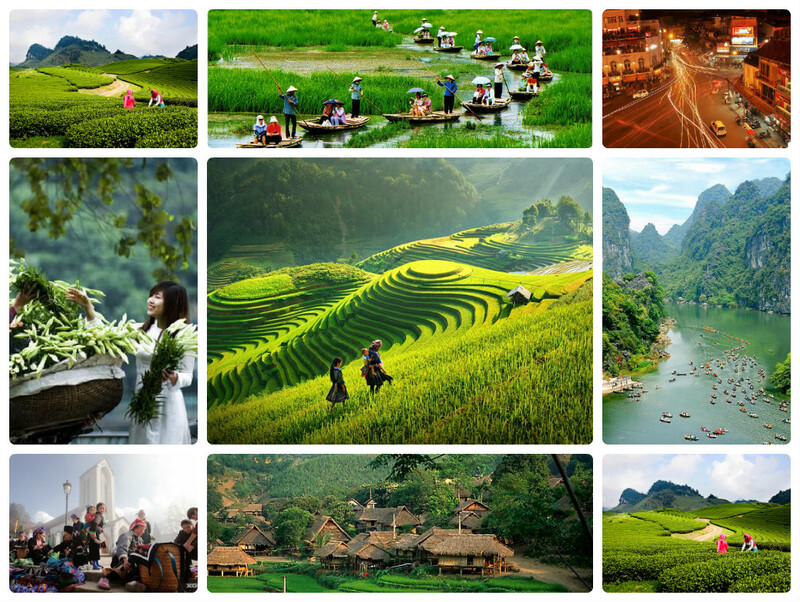 Check out hotel, enjoy lunch and transfer to Ninh Binh. Arrival Ninh Binh, have a dinner with special foods and overnight at hotel. 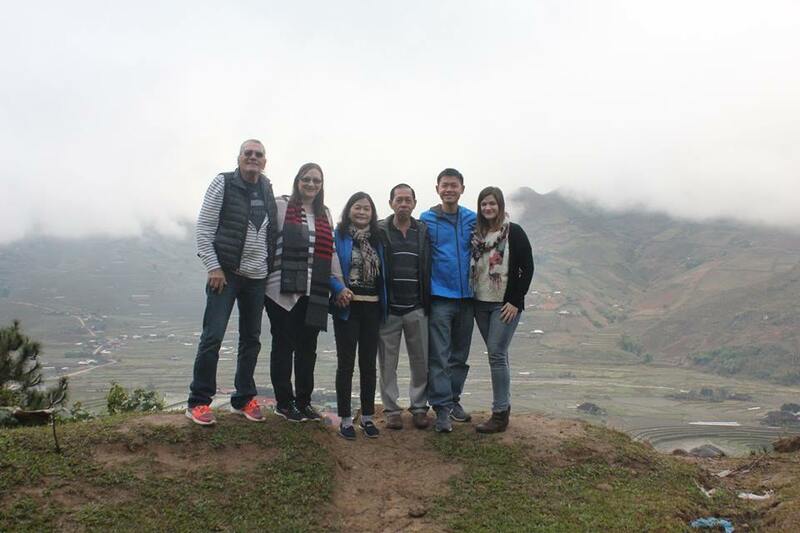 08:00: Our tour guide and car pick you up at your hotel to depart for Ninh Binh province. In the afternoon, depart to visit Trang An tourist attraction, take boat trip to visit cave complex: Sang Cave, Toi Cave, Ba Giot Cave, Nau Ruou in mystery and wildness, see scenery of mountain and rivers – a Ha Long on land of Ninh Binh. Move on to Tam Coc, on arrival check in hotel and have dinner and overnight in Tamcoc. Have breakfast at hotel, then enjoy Tam Coc boat trip for 2 hour to visit the most of beautiful landscape of Ninh Binh, during boat trip, visiting 3 different caves (1st cave, 2nd cave, 3rd cave). After Tamcoc, we can visit Bich Dong to see beautiful scenic pagodas, lush paddy fields, mountains, river and caves. Have lunch and return Hanoi. Arrival Hanoi, drop you at your hotel.